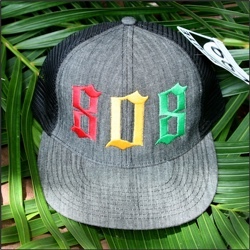 Route 99 Hawaii, based in Wahiawa, sells a popular line of embroidered hats that proudly declare the wearer’s local pride. From “Only in the 808” and “Aloha” to designs featuring the North Shore and Native Hawaiian motifs, the company has grown from a farmers market booth to a lifestyle brand sold in more than two dozen shops on Oahu, Kauai and Hawaii Island. 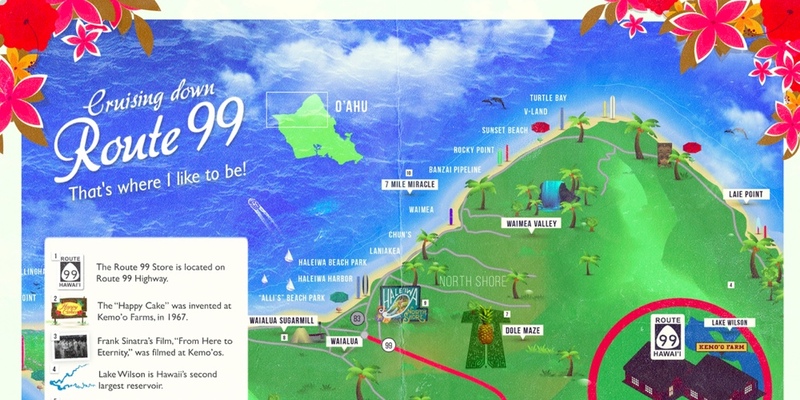 Earlier this summer, the company unveiled its own illustrated map of central O’ahu and the North Shore, featuring both popular and lesser known landmarks and attractions along Kamehameha Highway, otherwise known as Route 99. The new map, available for free online as well as at the company’s flagship store, expressly highlights the company’s home town of Wahiawa, which the company admits is sometimes bypassed by tourists heading for the North Shore. From the Kūkaniloko Birth Stones to Kemo’o Farms to Schofield Barracks, the map makes clear that there are a lot of interesting things to see on the way to Waialua and Haleiwa. 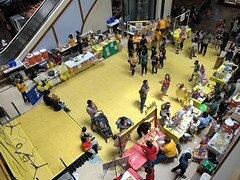 When I heard about the map, I reached out to company founder Charlie Teixeira, who launched the Route 99 Hawaii brand with her husband Washington as an offshoot of North Shore Embroidery. She was happy to share some of her story and talk about the genesis of the new map. Q. Before there was Route 99 Hawaii, there was North Shore Embroidery. How did you come to be in the stitching business? 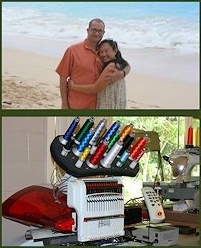 My husband, Washington, and I started North Shore Embroidery in 2011. Washington — whose name is quite popular in his homeland of Brazil — taught himself how to embroider and had a family business in Santos [in São Paulo] for some 12 years before moving to the North Shore in 2008. My back story is I was once a Graham modern dancer, then a history teacher, and am now enjoying country living and growing our business. Q. How did Route 99 evolve to be your leading brand? We wanted something simple, catchy (yes, it’s a play on the historical route 66), and that would reflect our North Shore living. We love the descent to the North Shore from Wahiawa on Route 99. 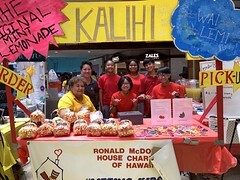 So in 2011, we reached out to the Haleiwa Farmers Market (when it was on Kamehameha Highway), where we started with a couple of basic designs. Rain or shine, we packed up everything in my wide-open Jeep (taking two trips back and forth) to set up. This experience, while exasperating at times, planted the seeds to our organic growth. Customers asked us for new designs and provided inspiration for new styles. Several wholesale accounts started there (like Waimea Valley’s gift shop and where the current farmers market is), and we gained the confidence to explore new avenues such as other craft shows, the swap meet, expos, et cetera. Q. Where did you get the idea to put out a Route 99 map? 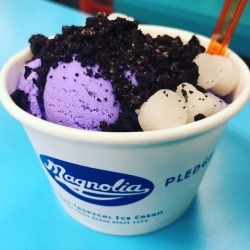 We’ve been at our current Wahiawa location since last October, actually on Route 99. As a former history teacher, I was curious about the area and wanted to learn more about its own back story. 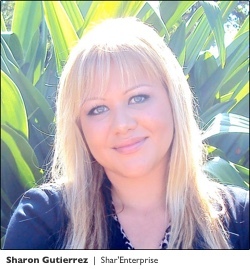 The Route 99 map was developed with the help of Sharon [Gutierrez], our marketing director. There were certainly enough ‘stopping points’ for us to celebrate, especially for those headed up to the North Shore. Having been a townie for more than a decade, I also knew that locals could also enjoy the illustrated map that highlighted places I had never been to, such as the birthing stones or the Schofield military museum. Q. How are you getting the word out about your company? Route 99 Hawaii looks very active on social media. In addition to our Route 99 Map, we’re also in the middle of a #Route99in99Nations campaign, where we’re aiming to connect with people in 99 nations who would post photos of themselves in Route 99 gear. So far, we’ve been promised 42 countries. We’re offering folks an incentive to participate and will donate at least $500 to a non-profit if we meet our goal by the year’s end. What I personally like about this campaign — beyond it’s marketing appeal — is that it opens up the connections to other cultures and may re-connect us to people we haven’t spoken to in a while. 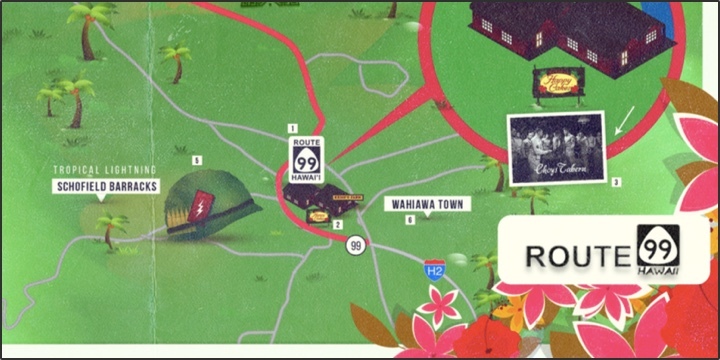 You can check out the Route 99 illustrated map on the Route 99 Hawaii website, or pick up the real thing at the company’s flagship store in Wahiawa next to Kemo’o Farms (1718 Wilikina Drive). To keep up with the company, follow North Shore Embroidery on Facebook, or Route 99 Hawaii on Instagram.